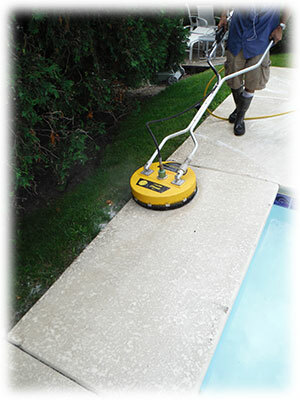 Is your pool or pool deck dirty, stained or otherwise unsightly? Let us help. Pool deck power washing should be performed annually to remove bird droppings, food, grease stains, and any other marks left by foot traffic, leaves or other debris before they can permanently stain or damage the underlying surface. In just a few hours, our team of highly trained uniformed professionals based in Glenview, IL will transform your pool and pool deck from dirty and dingy to clean and pristine. We can take pools with years of neglect and leave them looking like new. Our service is more than just cosmetic though, dirty water runoff from unclean pool deck areas carries dirt, grime, and buildup right into your pool making it harder to maintain and costing you more in chemicals and filters, not to mention the additional wear and tear on your pool equipment. Worst of all buildup on your pool deck that is left unattended can deteriorate the surface over time, causing thousands of dollars in damage. The nominal cost of keeping your pool surface clean far outweighs the cost of repairing the damage it can cause. We use professional surface cleaners that use heated water to evenly clean the surface without having to resort to high pressure streams which can severely damage some types of pool decks and coverings. Our highly trained, uniformed employees bring years of experience to the job. Our vast knowledge of soaps, detergents and algaecides ensure that stains, dirt and grime are removed effectively without damaging the structure or our environment. We service both commercial and residential properties on the North Side of Chicago including Glenview, Northbrook, Northfield, Wilmette, Highland Park, Glencoe and Winnetka. We have cleaned hundreds of pools and pool decks, from residential to commercial our team of professionals is equipped to perform jobs of all sizes. Let our pool power washing professional’s service your property today – contact us today for your free no pressure quote! Since 2001, our team has proudly provided the communities of Northern Chicagoland with comprehensive exterior and interior services. We are a division of Northern Seasonal Services. From Power Washing to Window Cleaning and Flood Cleanup, come experience what has kept so many families and businesses coming back to us over the years! Northern Power Washing proudly services the Northern Chicagoland suburbs. We are located in Glenview, IL and service much of the Northern Chicagoland area. Towns such as Arlington Heights, Des Plaines, Evanston, Hoffman Estates, Palatine, Schaumburg, Skokie and Mount Prospect are just a few examples of towns we offer Power Washing, Window Washing and Emergency Flood Cleanup services. If you’re interested in learning more please contact us. Ben the owner is outstanding. A genuinely nice guy. He called ahead to reconfirm and then again to say he would be a few minutes late. Nobody does that! His window cleaning was outstanding. Highly recommended. I will use him again. I purchased a Groupon to get my windows cleaned. I was very happy with the timely callback to schedule the window washing. Once they got to my house it was bing, bang boom! Very organized, not messy at all and and quick. My windows look great! Will use them for my next window cleaning or anything else they offer. I know they do a lot of other exterior cleaning. Friendly on the phone, gave a quote and stuck to it. Punctual, friendly, quality work. Made sure to keep the inside of the condos clean. Even did extra by moving furniture back in place after cleaning. Worked with us to coordinate 6 different units / owners. Rates cheaper than competitors.